Above: P’On (second from the right) with her Better Me class group. P’On grew up in a farming family in the province of Yasothorn in Thailand. She has two teenage children, and her daughter lives with her here in Bangkok. She is divorced and, with some help from her grandparents, needs to support her two children and the rest of her family at home on her salary. She only finished primary school, as her family needed her to work on the farm instead. So she is currently working as a maid for three different households in Bangkok, but is only able to earn around 10,000 baht a month with this work. Her main concern is her daughter, who needs to be supported while she studies. P’On would like to gain some security in her life for herself and her children. She is concerned about what will happen to their education and their futures if she gets ill and is no longer able to work to support them. She hopes that this program will help her get a better job, so that she can put some money aside for her children and her family, and will not need to be so scared about what the future might bring for them. She has also attended an initial induction session, four one-to-one mentoring sessions, and weekly English classes. P’On reports being so nervous on her first day at Pratthanadee that her knees were shaking and she felt sick. After three months, she reports a shift in herself and her confidence. She says she was lacking in confidence when she first arrived and she could not smile or look anyone in the eye. She said she had stopped bothering to care for herself and did not ever want to meet or speak to new people. Now she says that her confidence has improved a lot. Even her daughter reports a change in the way she dresses and holds herself now. She brushes her hair and takes more care over her personal appearance. She has started entering her boss’ house via the front door, like she is invited to, rather than going around the back. Following the How to Start Planning workshop, P’On developed a SMART plan with the final 3 year goal of setting enough money aside each month to eventually be able to pay her children’s school and university fees. When she achieves this, she will feel very proud because her children will be able to graduate, to get jobs and to support themselves. She is excited about the future now, because once she started to set a measurable and achievable goal, she found it possible to visualise her success in the future. This made her feel much more confident in the possibility that good things will come into her life. At the start, she reported feeling only 3 out of 5 for control over her own life. She now feels fully in control. P’On now reports 5 out of 5 for her excitement about the future. – She has become a warmer and more friendly person. – She has gained confidence. – She is happy and now can genuinely smile for the first time. “In our first session, P’On came across as quiet and sad. By the second session, it was clear that she was trying very hard to improve herself and her life. She was trying to learn how to accept herself as she is and to know her own limitations. She already looked better in this session and was clearly starting to enjoy herself more. In our most recent session together she was showing a very strong commitment to working hard, saving money and paying her daughter’s way through education. At the Foundation, I meet more friends and I gained knowledge. I have more confidence about myself and to do things on my own. I am proud and so happy to come to the Foundation. I like it a lot! I feel warm and can smile now. I am going to do the best of everything from today for a better life in the future. Thank you to the British Women’s Group for the opportunity. 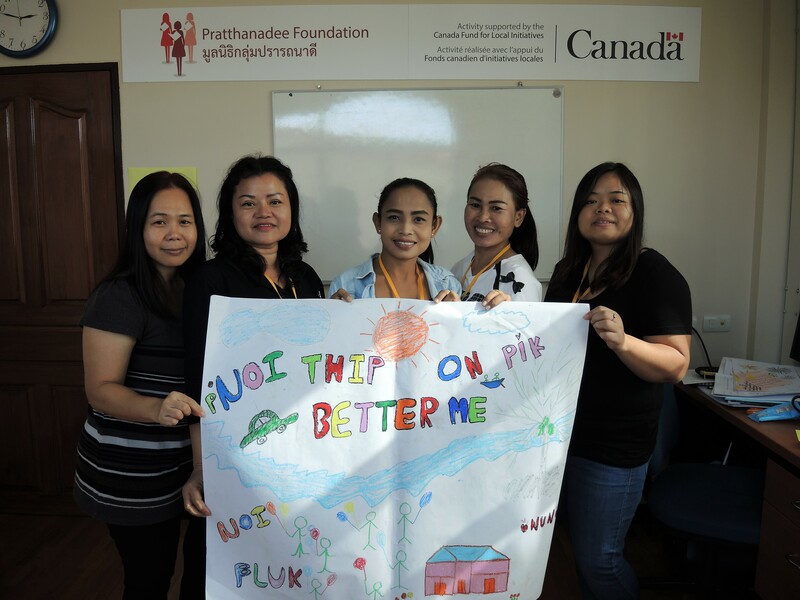 The British Women’s Group in Bangkok are generously supporting P’On (Onpriya) through the 9 month Better Me program at the Pratthanadee Foundation. This student report is published with the permission of P’On.